By the time you read this I will be in Biloxi, Mississippi, where I’m a guest at CoastCon 40. I have to say I am very much looking forward to this weekend and running some games, chatting on panel talks, meeting fans, hanging with my pal Sean, and making some new friends. I’m only bringing a few books, some Rifts® poker decks and a few art prints to sell to anyone interested. Meanwhile, all hands are on deck to hammer out one exciting new release after another. We have some very exciting plans for several game lines including Rifts®, Robotech®, Robotech® RPG Tactics™, Palladium Fantasy®, Dead Reign®, Heroes Unlimited™ and just about everything, really. I think our focus will be Rifts®, Palladium Fantasy®, Dead Reign®, and a few other settings the first half of the year, and Robotech® and Robotech® RPG Tactics™ in the second half, though there is a lot of setup going on for Robotech®/RRT happening right now. And for some really great news, Carmen Bellaire is planning to press forward with the Rifts® Board Game, with a Kickstarter launch sometime in April and running through part of May, 2017. Read on for details. The Rifter® Super-Subscription Offer has ended online. Thank you for your orders and support, they were very welcomed. I do want to remind current subscribers who may have missed the online drive that you can still call the Palladium office or pay by check and mail in your order till March 20, 2017. A little cushion for our loyal subscribers. See details in The Rifter® #76 and #77. The Rifter® #76 is a very fun issue with more than half being “official” source material, and the rest being unofficial source material which is pretty sweet too. “Official” for Rifts® and Palladium Fantasy® is The Primorda, new Elemental beings and their monstrous riding animals (good for monsters as well as steeds), and “official” adventure source material for the Splicers® I am Legion story which sees its conclusion in The Rifter® #77. There is also an adventure setting with villains and enemy forces suitable for Heroes Unlimited™ and Ninjas & Superspies™, and other good stuff. The Rifter® #77 is at the printer and will ship to Palladium on March 9, 2017. It is another cool issue with “official” adventure source material for Heroes Unlimited™ (Doc Feral and mutants), as well as some very fun material for Palladium Fantasy® (a new city-state to explore in the Old Kingdom) and Rifts® (a TW city and characters that will surprise you), and ... are you ready for it, the final chapter of the epic, Splicers® I am Legion adventure source material, also “official.” Ships March 9, 2017. UPDATE: Carmen Bellaire is BACK! Carmen is recuperating and doing as well as can be expected. I spoke with him on Tuesday, and he sounded tired and low key, but seemed to be in good spirits and was already tinkering with the rules for the Rifts® board game. Our sincere thanks to those of you who have expressed your support and well wishes for Carmen, his family, and the Rifts® board game. I spoke with Carmen and was shocked to learn he is still shooting for an April Kickstarter launch for the Rifts® Board Game Kickstarter – probably the middle or end of April, 2017. That means Carmen’s Kickstarter will run from the middle or end of April into the first half of May (tentative). When I spoke with Carmen he sounded a bit low key, but positive and in good spirits. He doesn’t want anything that has happened to stop the launch of his Rifts® board game Kickstarter and his game company Rogue Heroes™ LLC. We applaud Carmen for his tenacity and not giving up on his dreams, we just hope he paces himself. He seems highly motivated and says getting back to doing something he loves is helping with his recovery. The Rifts® board game is the brainchild of experienced game designer Carmen Bellaire, and the culmination of something like 2+ years in the making. He plans to launch the game as a Kickstarter by his game company Rogue Heroes, LLC, under license with Palladium Books. We approve everything, so I have seen all the amazing digital sculpts, artwork and hard work that has gone into the making of this game. This is a game every Rifts® fan will want to own. It offers detailed miniatures of your favorite iconic Rifts® heroes and Coalition troops in dynamic poses, powerful artwork and the game is fun to play. It truly captures the essence of Rifts® in a tabletop game. A typical game lasts approximately 90 minutes on average, as you battle your way through the Chi-Town ‘Burbs against the army of the Coalition States. I’m trying not to gush about how excited I am about this game and especially that Carmen is back to finishing it and launching his Kickstarter as planned! If this game interests you at all, please help support it. You can go to Carmen’s Facebook page to see more images and up-to-date information. Thank you. Welcomed ideas are coming from all over the place – staff, freelancers and fans like you – on ways to support and advance Robotech® RPG Tactics™, from existing product to Wave Two and beyond. We think we have some pretty exciting things in the works. Despite the long delays and what some people believe, Robotech® RPG Tactics™ has always been a passion project for us. We want to redeem ourselves in your eyes with the Wave Two rewards and so much more. We are trying to put together some big and small ideas for product and support, right now, and think we are looking at some exciting possibilities. We try to learn from our mistakes and strive to create a superior product, starting with Wave Two rewards. When we have the hard details, our Kickstarter backers will be the first to know about them. Chuck has been working on art and concepts, I have been working on text and finalizing concepts. Gonna be one heck of a book. Rifts® Heroes of Humanity, Rifts® HoH CS Arsenal, The Disavowed and Megaverse® in Flames are laying the groundwork for something big. I hope to assign more artwork for this book when I return from CoastCon. Artwork for Sovietski continues to come in and is looking good. I assigned a bunch of the artwork for this book before I left for CoastCon. Other books in development for Palladium Fantasy®: Lopan™ Adventure Sourcebook, Lopanic Games™ Sourcebook and Land of the South Winds™, among other things. Artist Nick Bradshaw continues to work on the interior art for this title, while E.M. Gist works on giving us another dynamic cover. The Rifts® Shemarrian Nation Sourcebook is now available, along with Rifts® Bionics Sourcebook, Rifts® Coalition Navy, the Rifts® Primer, the FREE Hell Followed™ Preview, Rifts® Black Market (one of my faves), Rifts® Mercenary Adventures™, Rifts® Mercenaries, MercTown™, Merc Ops™, and so much more, are all available now in PDF. You can also get ALL Robotech® RPG Tactics™ game cards, Robotech® and Rifts® Paper Miniatures along with Rifts® Lemuria, Rifts® Triax Two, The Rifter® #1-69, Rifts® World Books 1-30 and many other Rifts®, Heroes Unlimited™, Palladium Fantasy®, Nightbane® and other game line titles. 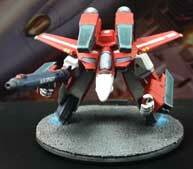 New Robotech® RPG Tactics™ material will be made available in the weeks ahead. All of it adds to the growing list of Rifts®, Robotech® and other Palladium RPG game titles available as PDF books, cards and support. A new title should be added every week or two, so watch for them. Robotech® RPG Tactics™ Wave 2 Paper Game Pieces, and all RRT game cards, Rifts® Ultimate Edition and 160+ other PDF Palladium titles, RRT stuff, G.M. helper kits and free material are on DriveThruRPG.com right now! More Rifts®, Robotech® and other Palladium game titles, paper miniatures and fun are coming to PDF in the weeks and months ahead. Watch for them. Recent PDF titles include Rifts® Sourcebook One Revised, Rifts® Sourcebook Two: The Mechanoids®, Rifts® Sourcebook Three: Mindwerks™, Rifts® Sourcebook Four: Coalition Navy™, Rifts® Bionics Sourcebook, Rifts® Ultimate Edition, Rifts® Lemuria, Rifts® Triax 2, Rifts® Mercenaries, MercTown™ and Merc Ops™, Rifts® Black Market, Rifts® World Book 30: D-Bees of North America™, Rifts® World Book 29: Madhaven™, Rifts® World Book 28: Arzno™, Rifts® World Book 27: Adventures in Dinosaur Swamp, Rifts® World Book 26: Dinosaur Swamp, World Book 25: Rifts® China Two, and World Book 24: Rifts® China One, among many, many others. There are also previews of Rifts® CS Heroes of Humanity™, The Rifter® #73, Northern Gun 1 & 2, Lemuria, Rifts® Vampire Kingdoms, Bizantium and many other Palladium titles. Check back every week to see which new PDFs of Rifts® World Books and other titles have been added! In addition to the titles listed above, The Minion War™ series of books, the Rifts® Coalition Wars®/Tolkeen series, Chaos Earth® Resurrection, all of the Dead Reign® (Zombie Apocalypse) titles, Splicers® RPG and most issues of The Rifter® are available NOW! 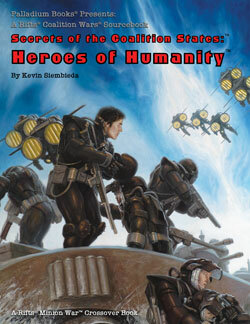 So are first edition rules of the Heroes Unlimited™ RPG and sourcebooks, Palladium Fantasy RPG® and sourcebooks, The Mechanoids®, and much more, available on DriveThruRPG.com. Rifts® Ultimate Edition, Rifts® Shemarrian Nation Sourcebook, Rifts® Bionics Sourcebook, Rifts® Sourcebook Four: Coalition Navy™, Rifts® Sourcebook 3: Mindwerks™, Rifts® Sourcebook Two: The Mechanoids®, Rifts® Sourcebook One Revised, Rifts® Mercenaries, MercTown™, Merc Ops™ and Mercenary Adventures™, Rifts® Black Market, Rifts® Lemuria, Rifts® Triax 2, Rifts® World Book 30: D-Bees of North America™, Rifts® World Book 29: Madhaven™, Rifts® World Book 28: Arzno™, Rifts® World Book 27: Adventures in Dinosaur Swamp™, Rifts® World Book 26: Dinosaur Swamp, Rifts® World Book 25: China Two, Rifts® World Book 24: China One, Rifts® World Book 23: Xiticix Invasion, Rifts® World Book 22: Free Quebec, Rifts® World Book 21: Splynn Dimensional Market, Rifts® World Book 20: Canada, Rifts® World Book 19: Australia, Rifts® World Book 18: Mystic Russia, Rifts® World Book 17: Warlords of Russia, Rifts® World Book 16: Federation of Magic, Rifts® World Book 15: Spirit West, Rifts® World Book 14: New West™, Rifts® World Book 13: Lone Star™, Rifts® World Book 12: Psyscape™, Rifts® World Book 11: Coalition War Campaign™, Rifts® World Book 10: Juicer Uprising™, and Rifts® World Book 9: South America 2 along with World Books #1-8 and various other Rifts® titles. Rifts® Chaos Earth® RPG, Chaos Earth®: Rise of Magic™, Chaos Earth® Resurrection™ and Creatures of Chaos™ are all available now. Two free Chaos Earth® Resurrection previews and many other previews. Rifts® Coalition Wars®: Siege on Tolkeen series – all six titles. Rifts® The Minion War™ series – six current books – consisting of Dimension Book 10: Hades, Dimension Book 11: Dyval, Dimension Book 12: Dimensional Outbreak, HU2 adventure sourcebook: Armageddon Unlimited™, Heroes of the Megaverse®, and Rifts® Megaverse® in Flames available now! Suitable for ALL settings, including Rifts®, Heroes Unlimited™ and The Palladium Fantasy RPG®. Dead Reign® RPG titles. The Zombie Apocalypse is yours to role-play with the Dead Reign® RPG. The core rule book and all sourcebooks are available now. FREE Robotech® RPG Tactics™ paper game pieces, force organization tables, stat cards, rules and special items – with more coming soon! FREE 12 highly-detailed, comprehensive Robotech® RPG Tactics™ assembly instructions for all the Wave One mecha – available now. FREE Robotech® RPG Tactics™ color guides are available now. Palladium Fantasy RPG® Paper Miniatures – Volumes #1-6 are available now. More are coming in the weeks ahead. 160+ Palladium titles, plus G.M. kits, and more. And more to come in the weeks ahead. Alex and I have added and continue to add a lot of vintage Star Wars toys and a growing number of all kinds of collectibles – and we’ll be adding more Palladium Books original art and items to the store, so keep an eye out for them. This includes one-of-a-kind original artwork, prints, Rifts® and Robotech® artwork by Kevin Long, me and others. There is also a range of limited editions, rare book titles and limited edition hardcovers, toys and more that are all being added to my ebay store over the next several weeks, so keep an eye out. Alex and I will keep adding items as our busy schedules allow, but we have a lot of fun collectibles available now and coming soon. Items include original art, out of print titles, redlined proofreader photocopies signed by me and the staff, signed manuscripts with editors’ corrections, some original art, hardcover books (including Rifts® Lemuria, Northern Gun™ One, Northern Gun™ Two, Megaverse® in Flames™, Beyond the Supernatural™ Gold, Rifts® Machinations of Doom™ Gold and Rifts® Ultimate Gold) and other items available. There are also hundreds of toys and action figures, all from my personal archives and collection. Take a look every weekend for new items added. To guarantee a dedicated gaming area and listing in the program book and online schedule, we need your descriptions and details over the next few weeks. Please start sending them in to NMI. Any Megaversal Ambassador can help you, but NMI is the primary Gen Con event coordinator. We had some awesome events the last few years, so let us, please, keep the trend going. Remember, G.M.s running Palladium events get a discount coupon for EACH game they run that they can redeem at the Palladium booth. We are looking for Game Masters to run any and all Palladium game settings: Rifts®, Robotech®, Robotech® RPG Tactics™, Palladium Fantasy®, Heroes Unlimited™, Splicers®, Nightbane®, Dead Reign®, Beyond the Supernatural™ and all the rest! We appreciate ALL of you, and love that you run games for us at Gen Con. Thank you. CoastCon is this weekend. I will be there with Sean Patrick Fannon (Rifts® Savage Worlds) and a number of other guests. Please bring books to sign, come to chat, come to play in the Lord DeSilca fantasy games I am running, get autographs and share a nice time. I look forward to seeing a lot of Palladium fans. CoastCon 40 is in Biloxi, Mississippi, March 3-5. The Rifter® #76 – Autumn issue – 96 pages – shipping NOW! 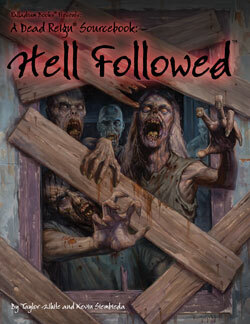 Hell Followed™, a Dead Reign® Sourcebook – 160 pages. Weapons, Armor & Castles of the Orient™ – 48 page, comic book size format. 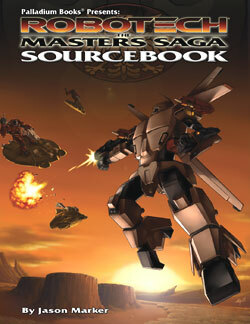 Robotech® The Masters Saga™ Sourcebook – New 8½ x 11 format, 160 pages. The Rifter #77 – Winter issue – 96 pages – March 9. It is at the printer! Rifts® Heroes of Humanity™ ARSENAL – 96 or 128 pages – March/April, in final production right now. It too is laying the groundwork for something big. 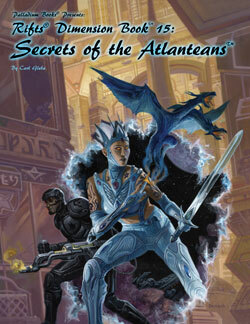 Rifts® Secrets of the Atlanteans™ – 192 pages – March/April, also in production now and looking great. Rifts® The Disavowed™ Sourcebook – by Kevin Siembieda and Matthew Clements – April/May. Garden of the Gods™, a Palladium Fantasy RPG® Sourcebook – by Kevin Siembieda – March/April. Dead Reign® Inner City Survival Sourcebook (tentative title) – Spring. Others – We may try to slip in a few small books before summer. Rifts® World Books and Sourcebooks, including Rifts® New Navy, Rifts® Antarctica, and others. At the printer. 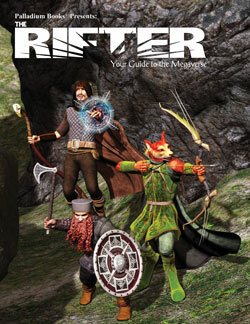 Adventure, madness, strange creatures and strange lands fill this issue of The Rifter®. This issue is a playground for heroes and a source of adventure, but beware the danger that lurks in the shadows. Every issue of The Rifter® is an idea factory for players and Game Masters to generate new ideas and find new avenues of adventure. It provides useful, ready to go source material you can just drop into your ongoing games. A doorway to new possibilities and numerous Palladium role-playing worlds. And the many new characters, O.C.C.s, powers, magic, weapons, villains, monsters, adventures and ideas for one setting can be easily adapted to any Palladium setting. Rifts® – City of Nowhere – an adventure setting by Brett Caron. Capitalism, magic and dark secrets build an enchanted city with a dark underbelly that may not hold. Heroes Unlimited™ “official” source material – by Kevin Siembieda. The mad genius of Doctor Feral breeds new mutant menaces, heroes and adventure. Four new super abilities. Palladium Fantasy RPG® – the city of Khemennu adventure setting by Ian Herbert. A holy city dedicated to the Church of Light and Dark, and the resting place of the legendary Sun Disc. A place of intrigue, magic and adventure. Splicers® – I am Legion, Part Six – by Charles Walton II, Chris Kluge and Lance Colley – “official” source material. This is it! The final battle against Legion! The Legion personality and her Black Shroud armor statted and described. Secrets and dangers revealed about the Factory Walker and more. Even in victory, the world may never be the same. 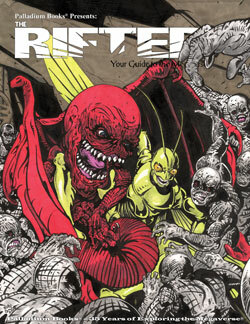 Rifts® cover by Michael “Madman” Leonard. 96 pages – $13.95 retail – Cat. No. 177. At the printer. Ships March 9, 2017. Rifts® Heroes of Humanity gave you updated Coalition Army O.C.C.s, ways to upgrade men-at-arms, new O.C.C.s, battle plans and strategies and tactics. CS Heroes of Humanity™ Arsenal provides an array of new Coalition hardware: weapons, armor, additional SAMAS, other power armor, robots, combat vehicles, gear and info. New CS weapons and gear. New CS SAMAS and power armor. New CS robots and combat vehicles. More secrets and information about the Coalition States. Wild adventure opportunities, fun and more. Part of the Minion War™ “Crossover” series. Written by Kevin Siembieda, Clements, Gleba and others. 96 pages – $16.95 retail – Cat. No. 893. March or April, 2017. “Desperate times require desperate measures. War has nothing to do with morality or justice. It’s all about winning or dying. We cannot bind our hands with high ideals, even our own, or worry about the laws of renegade nations or the rights of alien people. We must fight fire with fire. And you are the match.” – Colonel Lyboc addressing a Disavowed team. 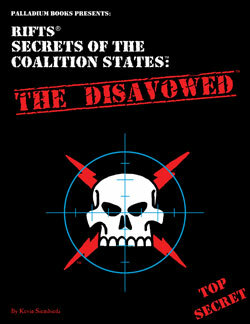 The Disavowed are so Top Secret that their existence is known only to a handful of the Coalition States’ most elite, top echelon, with Joseph Prosek II the mastermind behind the Disavowed operation, and Colonel Lyboc its shadowy face. Find out who these men and women are. How the Disavowed get away with using magic, traveling to other parts of Rifts Earth and even to other dimensions in pursuit of enemies and strategic information that cannot be had through conventional means. Learn about the secret parameters in which these hard-boiled warriors, secretly hand-picked by Joseph Prosek II, operate, why almost every mission is considered a suicide mission, and why they must forever be the Disavowed. CS operatives so secret that even the top military and political leaders right up to Emperor Prosek know nothing about them. And if they did know, would they condone their activity or condemn it? Are the Disavowed heroes or renegades? Assassins or soldiers? Madmen or super-patriots? Or a little of them all? Unsung heroes who keep the CS safe, or thugs and pawns of a shadow agency within the Coalition government? What role does the Vanguard play in this group? How do they reward their D-Bee “teammates” when the mission is over? What happens to the Disavowed when they have seen or learned too much? Adventure ideas galore and so much more. 96 pages – $16.95 retail – Cat. No. 892. Coming this spring. NEW! The Rifter® #76 – Available now! The Rifter® #76 is filled with strange creatures, adventure and fun across the Megaverse® and multiple world settings. Every issue of The Rifter® is an idea factory for players and Game Masters to generate new ideas and find new avenues of adventure. It provides useful, ready to go source material you can just drop into your ongoing games. A doorway to new possibilities and numerous Palladium role-playing worlds. And the many new characters, O.C.C.s, powers, magic, weapons, villains, monsters, adventures and ideas for one setting can be easily adapted to any Palladium setting. Every issue has material for Rifts® and usually 2-3 other Palladium game lines. The focus of this issue is Rifts®, Splicers® and RPG advice. Don’t forget, unofficial material can be easily adapted for use in ANY Palladium game setting. Rifts®, Phase World®, and Palladium Fantasy RPG® – Elemental Primordials™, by Greg Diaczyk and Kevin Siembieda – “official” source material. Elemental Primordials are something new in the Megaverse®. No one knows why they are appearing or whether that is good or bad. These new Elemental beings can be used as player characters or NPCs. Four Elemental Primordials and four riding animals from the Elemental Realms. Their very existence sparks potential storylines and adventure ideas. Get your first glimpse of them in The Rifter® #76. Rifts® Pecos Badlands Town – by Brett Caron. Thinking about doing some adventuring in the Rifts American Southwest? Mosey on over to Gohjjunk. Rifts® for Savage Worlds® Preview®. Get another look at what’s coming this winter. Splicers® – I am Legion, Part Five, by Charles Walton II, Chris Kluge and Lance Colley – “official” source material. The adventure reaches a fever pitch as we near the conclusion. More secrets, danger and combat. Heroes Unlimited™, Ninjas & Superspies, Nightbane® – Blood Diamonds by Thomas Morrison presents adventure source material with a war-torn setting, story and NPCs in Africa. But it could be just the beginning of a globe spanning campaign. Cover by Nicholas Bradshaw. Art by Walton, Dudley, and others. 96 pages – $13.95 retail – Cat. No. 176. Available now. NEW! Rifts® Secrets of the Coalition States™ – Heroes of Humanity™ – Available now! Rifts® CS Heroes of Humanity™ changes the landscape of Rifts North America and beyond, presents ways to upgrade and improve existing Men-At-Arms characters with Advanced Training, and includes new character classes, weapons, equipment, alliances and conflict to inspire epic new adventures. Rifts® Heroes of Humanity™ outlines the battle for the soul of humanity. The Minion War™ has spilled onto Rifts Earth. At the epicenter of the invasion is North America. If either of the two rival demonic forces succeeds in conquering the continent, the rest of the world shall follow and Earth will be annexed to Hell. The demon hordes believe no one can stop them. The Coalition States has something to say about that. For the first time in history, the Coalition States, Northern Gun, the Manistique Imperium, Lazlo, New Lazlo, Free Quebec, the Cyber-Knights, Lemurians, True Atlanteans, D-Bees, mages, mercs and many, many others stand together against a common enemy. Meanwhile, the Splugorth of Atlantis, Archie Three, the Republicans and the Vanguard engage in their own shadow war against the invading demon hordes, and each other. Heroes of Humanity™ lets unprecedented types of characters gather in mixed groups that would otherwise be ideologically opposed. Together they fight side-by-side for the greater good. New ways to upgrade your existing Men-at-Arms characters. Coalition Demon Hunter school and advanced training programs. New Coalition O.C.C.s like the Death Knight and Skelebot Specialist. 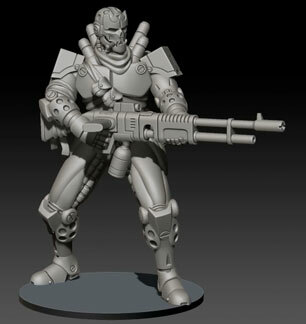 Coalition military O.C.C.s expanded such as the CS Juicers, CS Combat Cyborgs, Psycho-Stalkers, Coalition psychics and more. New CS gear such as the Hellbuster and Falcon Death Wing. CS battle plans, world information and many adventure ideas. The strategies and tactics of the demons against humanity. The strategies and tactics of the Coalition States and its allies. Summary of Demon and Deevil vulnerabilities. One Xiticix battle plan and who really pays the price. Plenty of guidelines, tables and rules to help you run it all. Art by Charles “Chuck” Walton II, Amy L. Ashbaugh, Nick Bradshaw, Mark Dudley, Allen Manning, Brian Manning, Mike Mumah, Apollo Okamura, Tanya Ramsey, Benjamin Rodriguez, and Kevin Siembieda. Written by Kevin Siembieda, Carl Gleba, Matthew Clements and others. 160 pages – $20.95 retail – Cat. No. 889. Available now. Hell Followed™ – Now Shipping! In the wake of the Zombie Apocalypse, survivors find themselves trapped in a living hell. As everyone struggles to survive against the ravenous dead, some rise up to be heroes fighting for those in need and against all manner of evil – living and dead. Be more than a survivor. Accept the new world and do something about it. 11 New types of zombies, including the Armored Brute, Dead Mound Giant, Seeker and more. 7 New Apocalyptic Character Classes. Masked Lunatics – heroes or madmen? Cults, good and bad, plus other weirdness and dangers. 21 Disasters to complicate survival. Each described with damage stats, penalties and consequences. The most comprehensive information of this type ever presented! Blizzard, Earthquake, Hurricane, Tornado, Toxic Spill, Wildfire, and more. Government enclaves. Could the government or its military still exist? If so, where are they? What are they doing? 8 Government conspiracy theories. Each fuel for creating adventures and building different organizations. Tables for creating government enclaves and their purpose. Abandoned Emergency Relief Centers and the resources they may still have to offer survivors, if they can get to them. Random tables and ideas for adventure. Take your zombie campaign to the next level! Written by Taylor White and Kevin Siembieda. The biggest Dead Reign® sourcebook yet. Adaptable to other Palladium settings. 160 pages – $20.95 retail – Cat. No. 236. Available now! True Atlanteans are descendants from Earth’s past. The survivors of the sinking of Atlantis (really a dimensional mishap) and travelers of the Megaverse, wielders of Tattoo Magic and other lost mystic arts. Most people regard them as heroes, but are they? The Sunaj Assassins are mythic villains feared by all, yet they too are True Atlanteans who serve dark forces. For the first time, much of the story behind True Atlanteans and their secrets are revealed. Optional Atlantean character creation tables including clan heritage and other factors. Secrets of the stone pyramids, different types/purposes and powers. Many new magic tattoos, magic spells, weapons and armor. Atlantean hideouts and secret communities across the Megaverse. The Sunaj Assassins, their secrets, history and plans for the future. Atlantean Monster Hunter O.C.C., Atlantean Defender O.C.C. and much more. And this is just the tip of what this book contains. Written by Carl Gleba. Additional text and ideas by Kevin Siembieda. Final page count and price yet to be determined, but probably 160-192 pages – $20.95-$24.95 retail – Cat. No. 890. For the first time ever, Rifts® is captured in a deck of playing cards. Each card a powerful image. 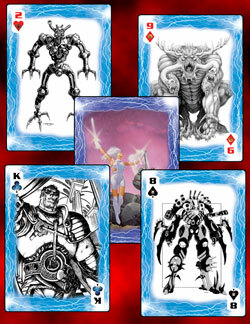 Perfect for playing cards, collecting, gifts and use as an Action Deck for Pinnacle’s Rifts® Savage Worlds game line. Gen Con gamers went wild over the two Rifts® Poker Decks and you will too. Both contain iconic Rifts® artwork and characters, and look gorgeous. The color and design of both poker decks makes the artwork pop and a joy to use. Available now. Standard US Poker size deck of playing cards. Rifts® specific symbols for each suit. 52 full color playing cards, plus 2 Jokers. Diamonds are magic. Clubs are D-Bees. Hearts are heroes. Spades are the Coalition States. Each card is a unique, color image. Artists include John Zeleznik, Scott Johnson, Kevin Long, David Dorman, Charles Walton II, Mark Evans, and others. The back of the cards is the artwork from the cover of Rifts® Ultimate Edition depicting a Ley Line Walker with an Alien Intelligence emerging from the Rift opening behind him, energy swirling. Art by Scott Johnson. Customized, full color, Rifts® tuck box. $11.99 retail – Cat. No. 2575 – available now. 52 iconic images and characters by your favorite artists. This second deck of playing cards captures Rifts® in a different light. Each card features a different iconic, black and white illustration set in a color border of rippling magic energy from the Rifts. Illustrations are by a wide range of fan favorite artists. A fun and attractive item for playing cards, collecting, and other uses. 52 playing cards featuring iconic illustrations, plus 2 Jokers. Diamonds are monsters. Clubs are heroes. Hearts are robots and power armor. Spades are the Coalition Army. 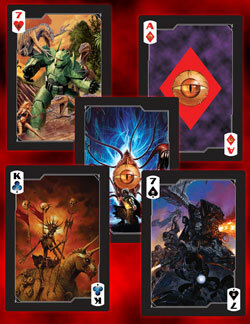 Each card has a unique illustration of a famous Rifts® hero, monster, mech or agent of the Coalition. Artists include Kevin Long, Ramon K. Perez, Freddie Williams II, Michael Wilson, Jeffery Russell, Apollo Okamura, and others. The back of the cards is the artwork from the cover of Rifts® Psyscape™ depicting a beautiful female psychic warrior, triumphant over a robotic enemy. Art by John Zeleznik. $11.99 retail – Cat. No. 2576 – available now. Robotech®: The Masters Saga™ Sourcebook – New, large format 8½ x 11 sourcebook – Now available! Robotech®: The Masters Saga™ Sourcebook has been enlarged to the standard 8½ x 11 inch format and 160 pages. Artwork was given the deluxe treatment – large, clear, and detailed to go along with the wealth of information about the Second Robotech War, the Army of the Southern Cross, its combat forces, mecha, weapons, and vehicles. The same comprehensive treatment was given to the invading Robotech Masters. Forget the corny drama, the emphasis of this sourcebook is on the Second Robotech War and the equipment on both sides. Making the Masters Saga a big mecha and equipment book that you will want in your collection. 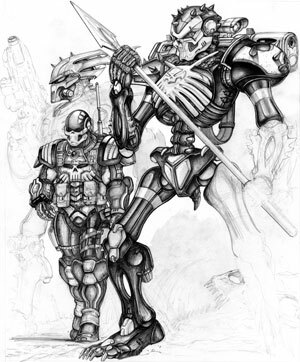 Did you know the Army of the Southern Cross used power armor and Battloids in addition to their famous mecha? You’ll find out all about it in this comprehensive 160 page sourcebook. Much of it described and statted out in an “official” capacity for the very first time in this sourcebook. Note: Only the size, size of artwork and layout has changed. The text and data are the same as the manga-sized edition, apart from eratta and minor additions. 40+ weapons; pistols, rifles, grenade launchers. 15 O.C.C.s and MOS skill packages for the 8 main branches of the ASC and the 7 Special Forces Divisions operating under the Tactical Corps. 14 ASC vehicles of the Army of the Southern Cross (ASC). ASC Tactical battle shields, jet packs and other gear. ASC Veritech Mecha including the Ajax, Logan, Spartas Hover Tank, Myrmidon Light Hover Tank. 6 ASC power armor suits. The Golem Autonomous Patrol Robot. The Robotech Masters and their legions. 6 different Bioroids, as well as the Bioroid Terminator, the Bioroid Invid Fighter, hover sled & more. Tirolians, spacecraft and other gear and info. Cover by Apollo Okamura. Interior art by the Mannings and others. 160 pages – $20.95 retail – Cat. No. 552. Available now. Robotech® is getting hotter and hotter. It is the Number One Anime on Crackle, the Robotech® movie from Sony Pictures sounds like it is going to be become a reality, more Robotech® licensed products are appearing, and Palladium is gearing up toward the release of Robotech® RPG Tactics™ Wave Two and more Robotech® products. Ah, but the core game and expansion packs to get you started are available right now. Robotech® RPG Tactics™ is a fast-paced, tabletop combat game that captures the action and adventure of the Robotech® anime. Two or more players can engage in small squad skirmishes or scale up to massive battles. Relive the clashes of the First Robotech War, engage in stand-alone tactical games, or use the dynamic game pieces to enhance your Robotech® RPG experience. 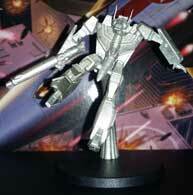 Or simply collect your favorite mecha from an expanding range of top-notch game pieces. Get yours now. Robotech® RPG Tactics™ Core Box Set (Main Game) – 34 detailed game pieces – 53 game cards, 24 custom battle dice, decal sheets, rule book and more – $99.95 – Cat. No. 55100 – Available now. UEDF Valkyrie Wing (6 game pieces) – $36.95 retail – Cat. No. 55201 – Available now. UEDF Tomahawk/Defender Destroids (4 game pieces) – $32.95 – Cat. No. 55202 – Available now. UEDF Spartan/Phalanx Destroids (4 game pieces) – $32.95 retail – Cat. No. 55203 – Available now. Zentraedi Regult Battlepods (4 game pieces) – $36.95 retail – Cat. No. 55401 – Available now. Zentraedi Artillery Battlepods (6 game pieces) – $36.95 retail – Cat. No. 55402 – Available now. Zentraedi Glaug Command (3 pieces) – $36.95 retail – Cat. No. 55403 – Available now. These dynamic pieces are available as a regular item in the Palladium store. They are powerful fun and only have 4-6 parts, so they are easy to put together. They look awesome on your shelf or in your game. Get yours while supplies last. © Copyright 2017 Palladium Books Inc. All rights reserved. Rifts®, The Rifter®, RECON®, Splicers®, Powers Unlimited®, Palladium Books®, The Palladium Fantasy Role-Playing Game®, Phase World®, Powers Unlimited®, Nightbane®, Megaverse®, The Mechanoids®, The Mechanoid Invasion®, Coalition Wars®, Chaos Earth®, Dead Reign®, and After the Bomb® are Registered Trademarks of Palladium Books Inc. RPG Tactics™, Beyond the Supernatural, Coalition States, Heroes Unlimited, Ninjas & Superspies, Minion War, Mysteries of Magic, SAMAS, Thundercloud Galaxy, Three Galaxies, Vampire Kingdoms, and other published book titles, names, slogans and likenesses are trademarks of Palladium Books Inc., and Kevin Siembieda.